Find out more about the Lorex Security Surveillance System with Night Vision Cameras. Includes features and frequently asked questions. 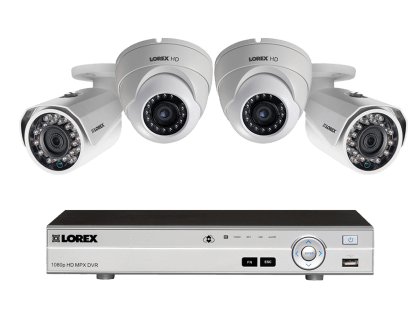 The Lorex Security Surveillance System with Night Vision Cameras is a complete 1080 HD surveillance system by Lorex that comes with a DV700 DVR and four weatherproof cameras. Businesses use the system for its heightened level of clarity and detail. 1080P DVR can support up to 4 cameras. 4 HD 1080p security cameras. 150 ft. night vision range. Pros: Easy to install. Night vision clarity is very good. Clean look once installed. Cons: Different apps for different systems. Online support is slow. Bottomline: The system is affordable, functional, and offers many options. The software interface is easy to use, and the cameras provide excellent picture quality. What are some Lorex Security Surveillance System with Night Vision Cameras alternatives? JOOAN 2MP TVI Security Camera System. Where can I buy the Lorex Security Surveillance System with Night Vision Cameras security camera system? The Lorex Security Surveillance System with Night Vision Cameras (MPX422DW) is available on Amazon and on the Lorex website. Does the Lorex Security Surveillance System with Night Vision Cameras work at night? The LBV2711B and LEV2712B cameras have a night vision range of up to 130 ft. in low light, and 90 ft. in complete darkness. Can the Lorex Security Surveillance System with Night Vision Cameras be used in any weather? Both sets of cameras can withstand temperatures of up to 140 degrees, and down to -22 degrees. They are completely dust resistant and highly water resistant.